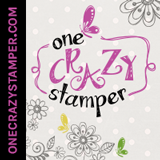 Hi it's Bev here today and I am super excited as this is my first DT project for One Crazy Stampers using High Hopes Stamps. I also am thrilled to tell you that I will not be doing cards but scrapbook layout pages and some of the accents will be co-ordinating stamps for the themes of the projects. It should be great fun. First up is a page of my hubby "Kenny" fishing and what better stamps as the fisherman, the sign post and the words "gone fishing". To start my project I stamped the images .... Gone Fishing wording was fit into the sign and then the fisherman. I start with the paper background, accent papers, title and accents are picked out. I added a tilt border on the top and bottom and added wrapped twine at the seams. The chipboard accents and title are copic coloured also. These super cute images are popped forward on top of the chipboard accents. Other: Whisker Graphics twine, Blue Fern Studios chipboard, Signo white gel pen, Craft gel stickers, burlap ribbon.